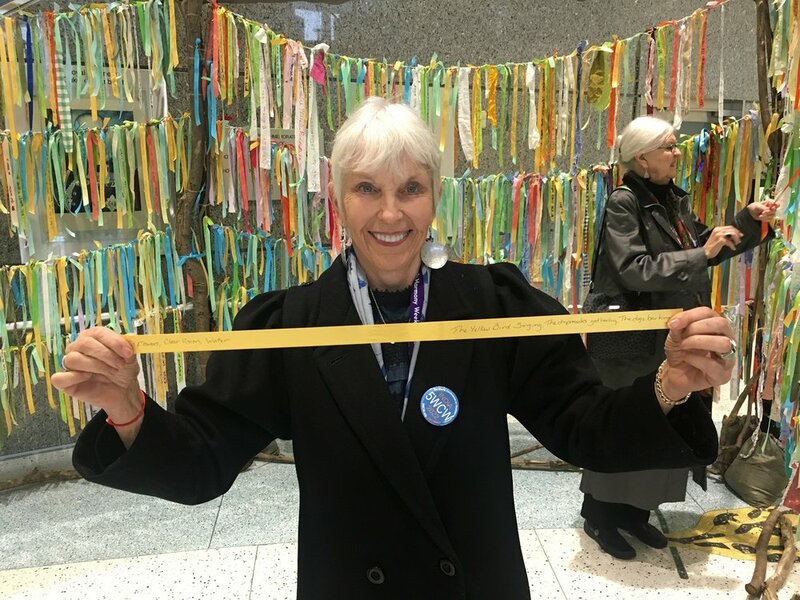 I was first inspired by the Climate Ribbon when I witnessed it at the Parliament of the World’s Religions in Toronto. I was there on behalf of Spiritual Directors International (SDI), to build relationships and partner with people and other organizations. Our work is to advocate for spiritual companions – people who listen to others on a deep level. 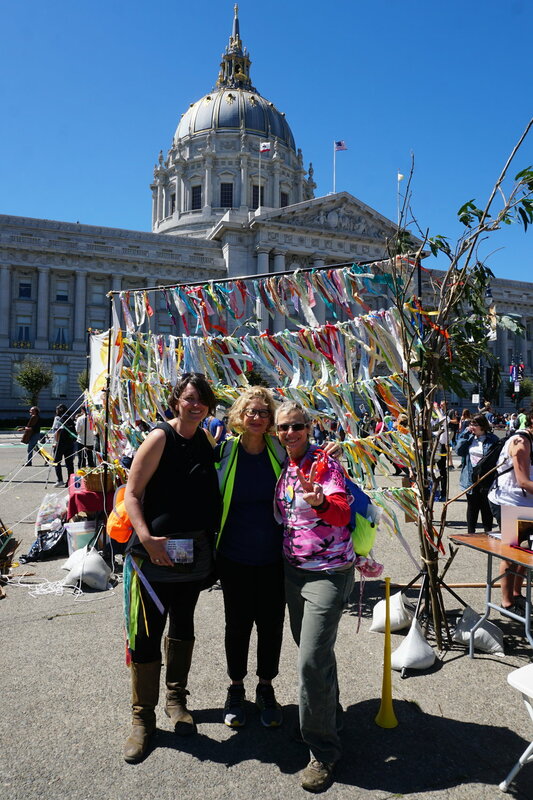 I was moved by the ritual space created by the Climate Ribbon Project. Most topic-oriented art objects I encounter tend to veer into polemics or offer didactic stances one way or another (“Climate change is bad! Stop driving your car! Etc, etc”). What I found resonant is how the Project creates space both for reflection and for companionship. The project invites the viewer in to participate with the work in two ways. 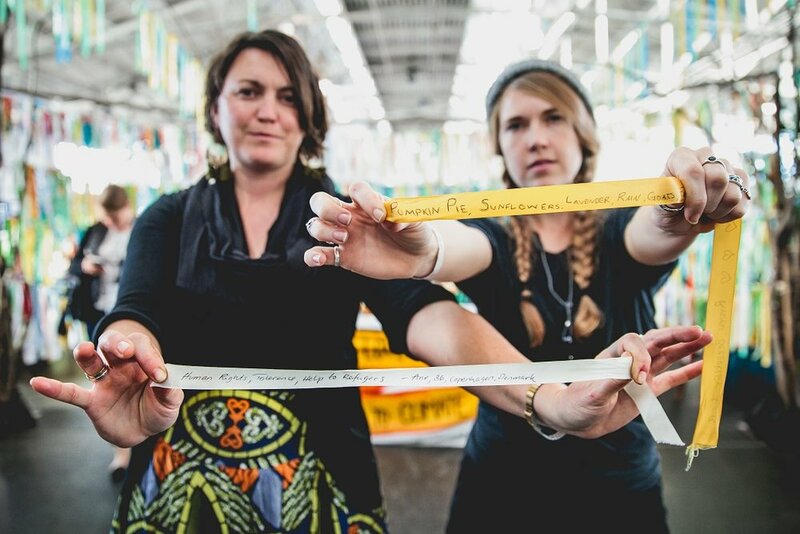 It invites the viewer to contribute via writing on a ribbon, to share that which the viewer stands to lose to climate chaos. I took a ribbon and wrote “snow capped peaks” – the mountains I climb with my dad, in which their delicate ecosystems depend on winter snowpack. This was added to the Project, but this is only half of the equation. I am then invited to view someone else’s ribbon, and to hold their contribution as prayer, as remembering, and I would add, as spiritual companioning. Seeing all the ribbons together, in grief and in hope, unites us in our longing and in our action. 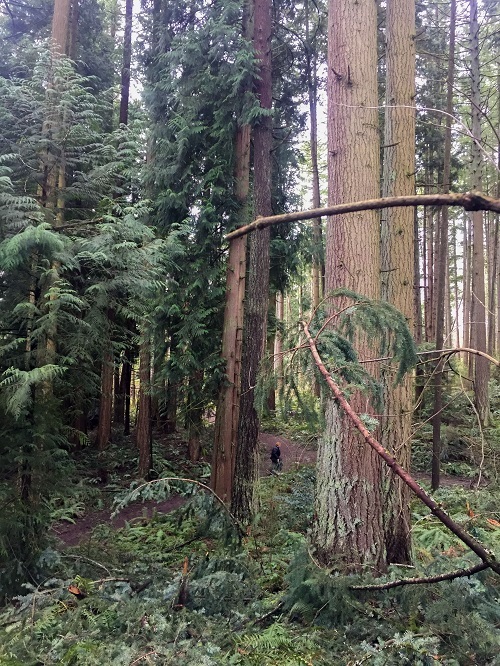 Upon returning home from Toronto, my focus shifted to planning for the SDI Annual Conference, which just took place in Bellevue, Washington this past March. As the Visual Media Coordinator, part of my work is to bring artistic expression and visual aesthetic to our conference spaces. 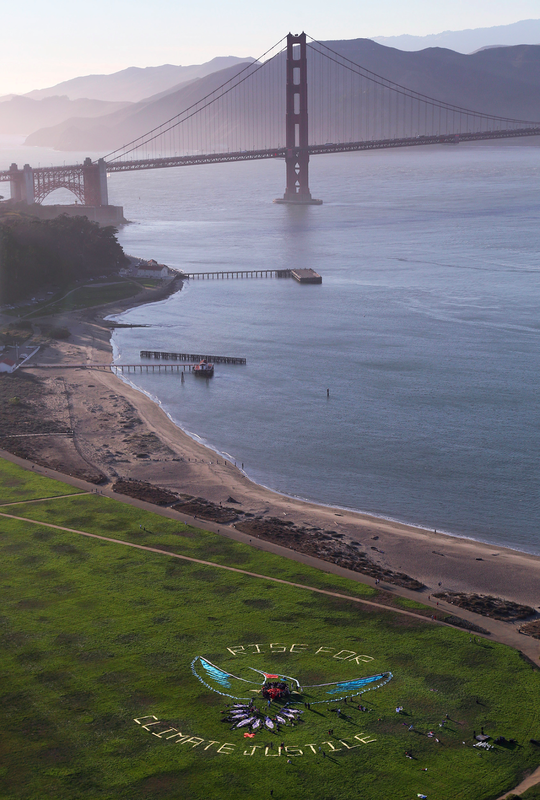 The Climate Ribbon Project presents itself as an open-source DIY installation that takes on the shape of the locality and participants in which it is manifested. 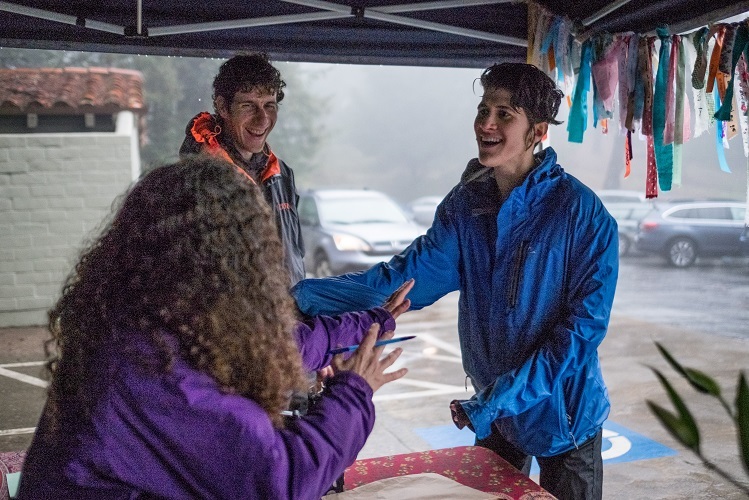 Between myself and Lizzie Salsich, our Community Outreach Coordinator, we collaborated with the Climate Ribbon Project Team and worked out a plan to bring the project to Bellevue for our conference. For our local version of the project, I knew that I wanted to reinhabit the memories of my childhood, and build it from fallen tree branches. 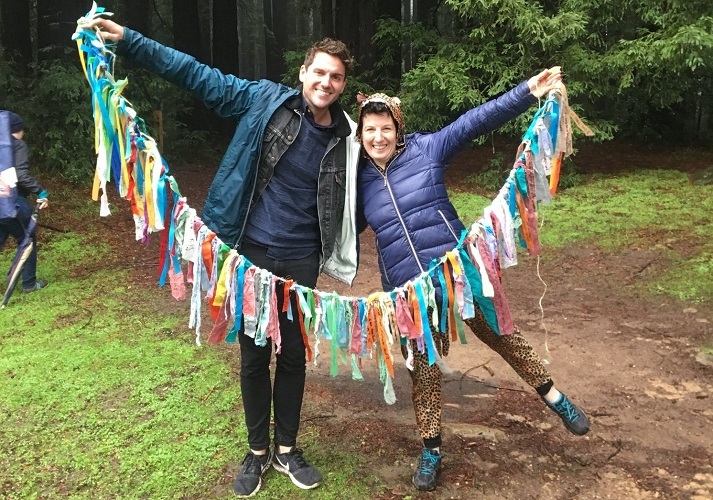 Together with Kristen Hobby, our Australia Coordinator who lives in Singapore, we went to Bridle Trails State Park, a 489-acre wooded sanctuary near where I grew up, and gathered fallen branches to create the “shelter” for our installation. From there, I compiled materials to serve as the structure. Rae Abileah, Project Team Member, sent us a box of ribbons to use. We took our materials to the Meydenbauer Center where our conference was being held, and I entrusted two wonderful volunteers, Missy French and Elizabeth Guss, with the assembly. They did an amazing job, considering I gave them a pile of tree branches, some twine, and some 2x2s and told them to make something based on a very rough “back-of-a-napkin” sketch that I made that morning! 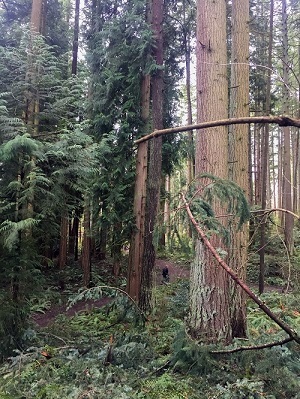 We assembled the structure from local Douglas Fir and Red Cedar branches, to which I have a deep spiritual connection. The finished installation took on the form of a shelter, in which one could stand within and be covered by its thick green branches and breathe in the sweet complexities of its comingled scents. The 2019 Spiritual Directors International Conference was in my backyard and I volunteered to help with setup and cleanup. Somehow, within the lovely order of the universe, I was given the assignment to assemble the Climate Ribbon project – Northwest Style. What a fun opportunity to reflect in action. From a simple sketch of a U-shaped arbor, we worker bees assembled lumber to create a frame and draped it generously with freshly-cut evergreen boughs and branches. Putting fir branches on the frame, we enjoyed the clean fragrance reminding us of where we live. Putting up the ribbons from previous displays, we connected to people from other countries with their yearnings and love of nature. The ribbons became both a visual and a spiritual immersion into the beauty of our created world. I reflected on what I would miss, what I loved and feared losing. My two ribbons spoke of my own experience of loving the created world, our common home. Over the three days of the conference, the ribbons grew in number as others penned their own thoughts. 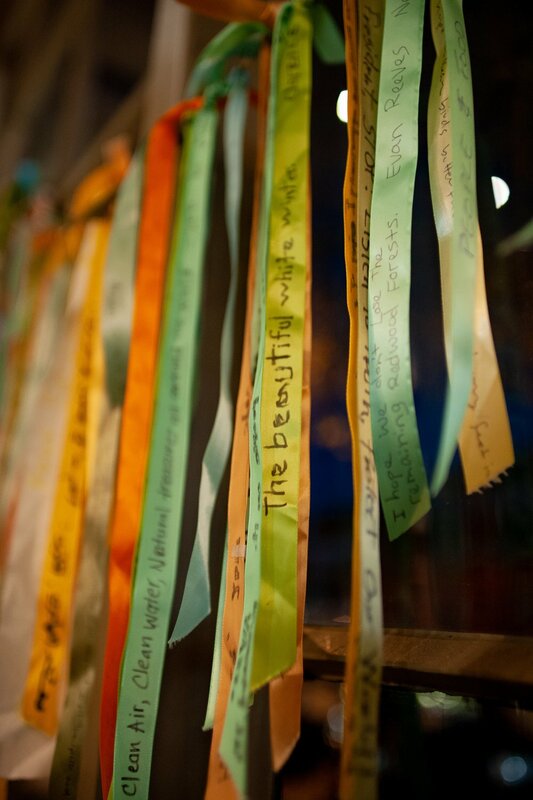 From a sprinkling of ribbons from previous locations, the arbor grew almost opulent with its prayers for our earth. Inside connected to outside with simple materials through loving hearts. The display provided ritual space for our conference participants – a contemplative shelter where one could find a bit of rest and oasis amidst our rich (and sometimes intense) plenary talks and workshops. 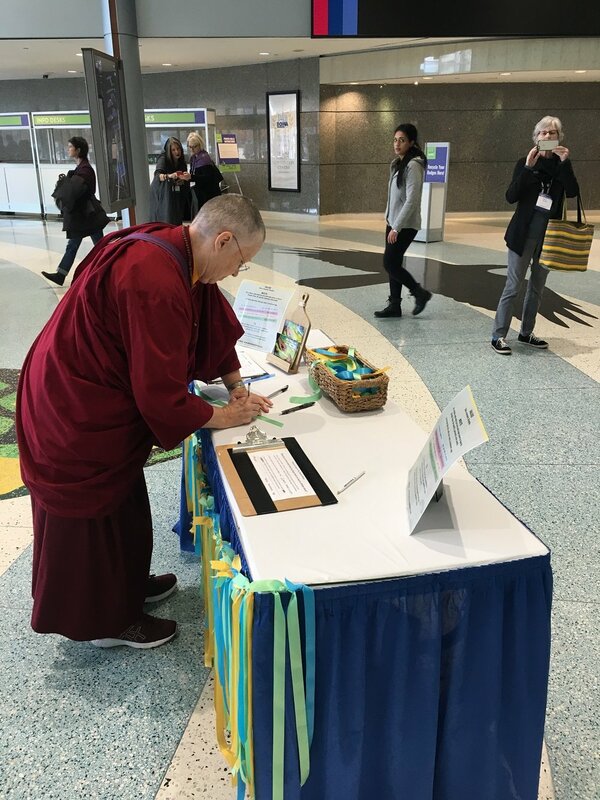 It offered spiritual companionship – I saw many participants wearing on their wrists the ribbons they had taken that others had contributed, as shared grief and a walking prayer. It also offered us the space to contemplate action – something that our organization is exploring as we collectively move from our meditation cushions and out into the world in service to our communities and in hope to the world. When the conference concluded, I helped take the display down. That was the opportunity for me to read more prayers and brief comments on ribbons. It was then that I took a ribbon for my continued prayer. Hana from Wisconsin, some 45 years younger than I, is now my prayer companion in love of Earth. 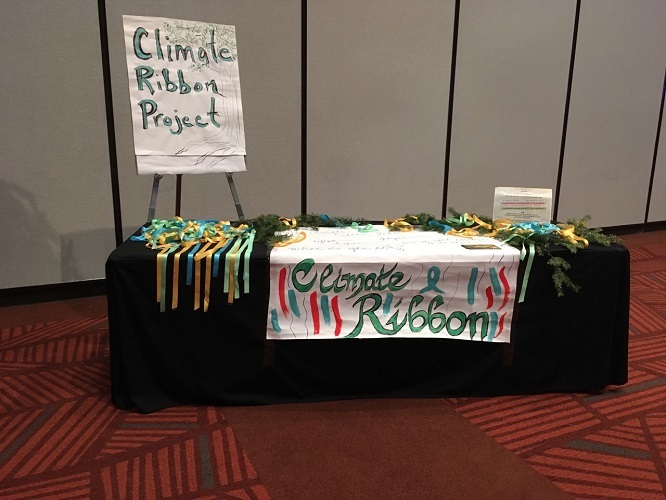 Our version of the Climate Ribbon Project embodied everything I had hoped for in bringing it to our conference. Its inherent flexibility and open-source nature allowed for us to bring to it our organizational focus on spiritual companionship and contemplative practice. The project inhabits both a ritual and a political space, and brings both together harmoniously – a language which we desperately need in these urgent times. And on a personal level, it allowed for me to create it using locally-sourced materials, as well as the “locally-sourced” content of my own memories of this place; it allowed for me to walk under these trees I so deeply cherish, and to offer gratitude for them. I was able to process the possibility that these things are not permanent, and renewed the vigor and responsibility I have to protect these things, for myself, my 10-year-old son, and to gather with all peoples who too walk under these trees, under these snow-capped peaks, and see that we are all one. 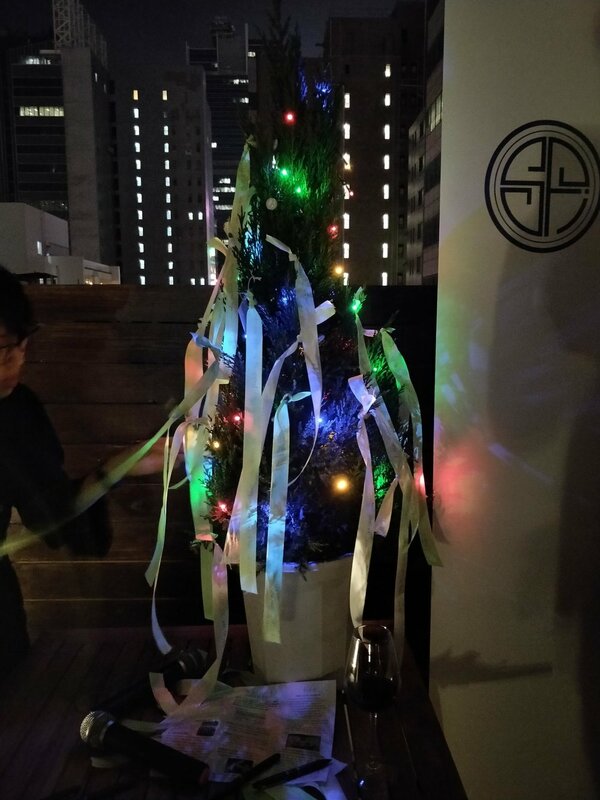 The Sustainable Finance initiative (SFi)’s network of investors gathered together to mingle over holiday drinks and reflect on the past year in Hong Kong. 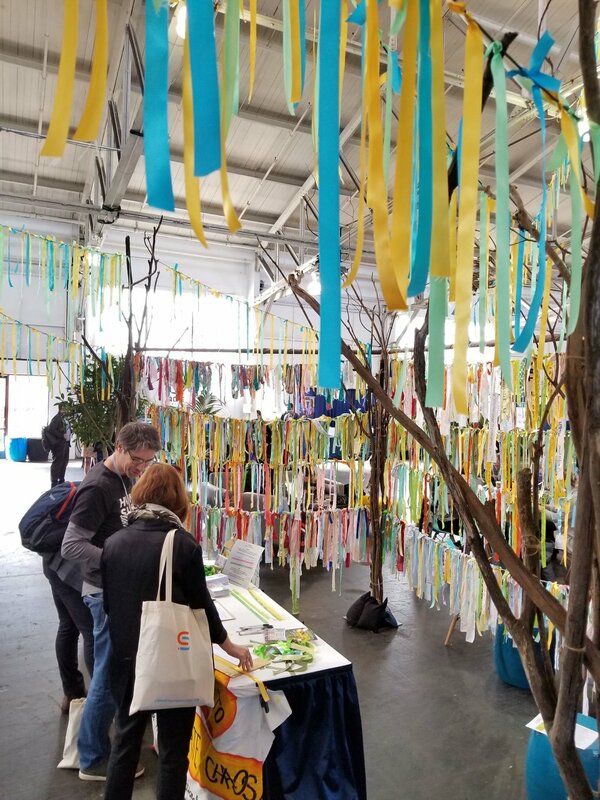 During the event, they held a Climate Ribbon session in which investors shared what they love and hope never to lose to climate chaos. 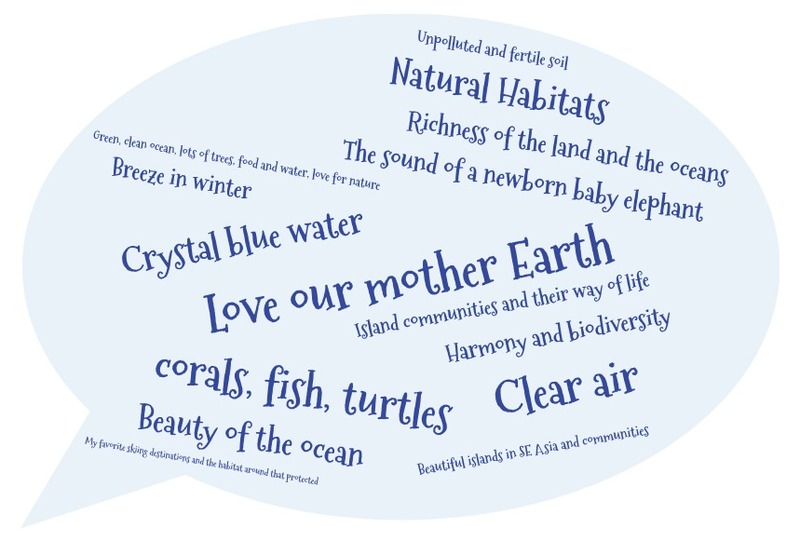 Key messages shared on the night can be seen in the word-cloud graphics below! 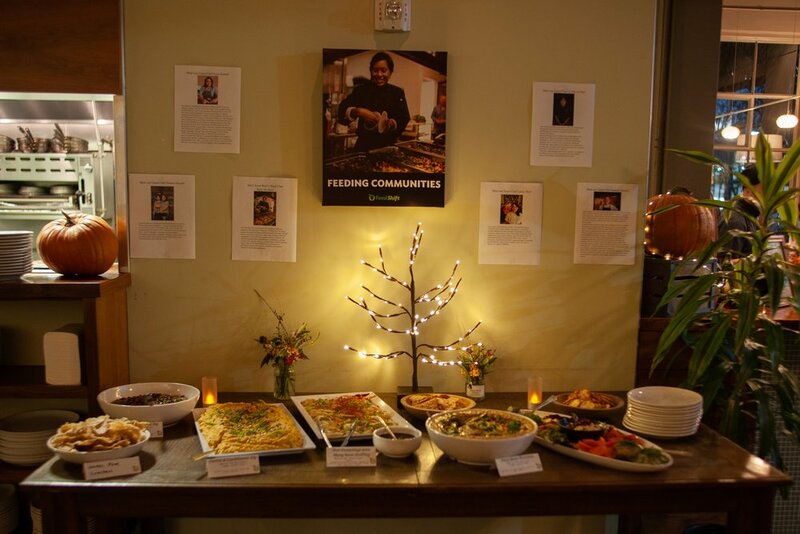 In addition to scrumptious locally-made vegetarian food and drinks, take-home products like pickles and jams, and a silent auction, attendees at Food Shift’s 7-year anniversary party in Oakland, CA witnessed a beautiful Climate Ribbon display. 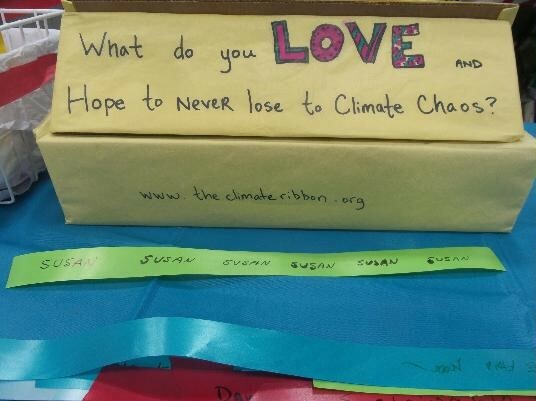 Many of them filled out ribbons with their thoughts of what they love and hope not to lose to climate chaos, and these ribbons are now displayed at Food Shift’s office. 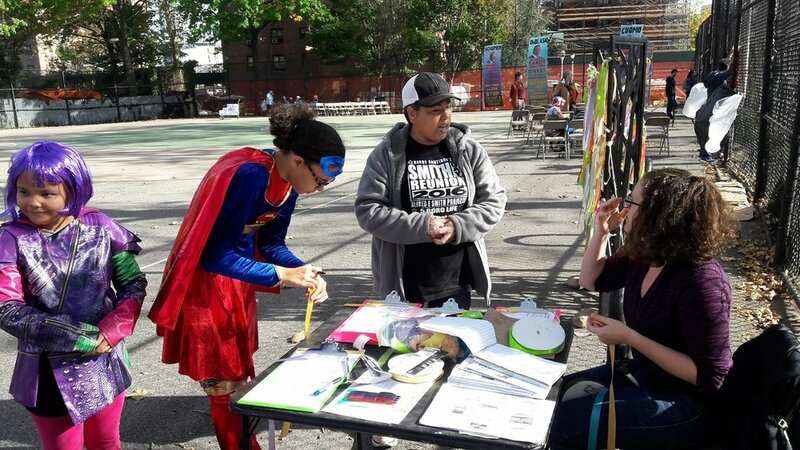 It’s so nice to see Food Shift take interest in the Climate Ribbon, and with the aid of our DIY kit (available on our Participate page), take the initiative and include the Ribbon in their event! In the first week of November 2018, over 7,000 people from all over the world converged in Toronto, Canada for the Parliament of the World’s Religions. 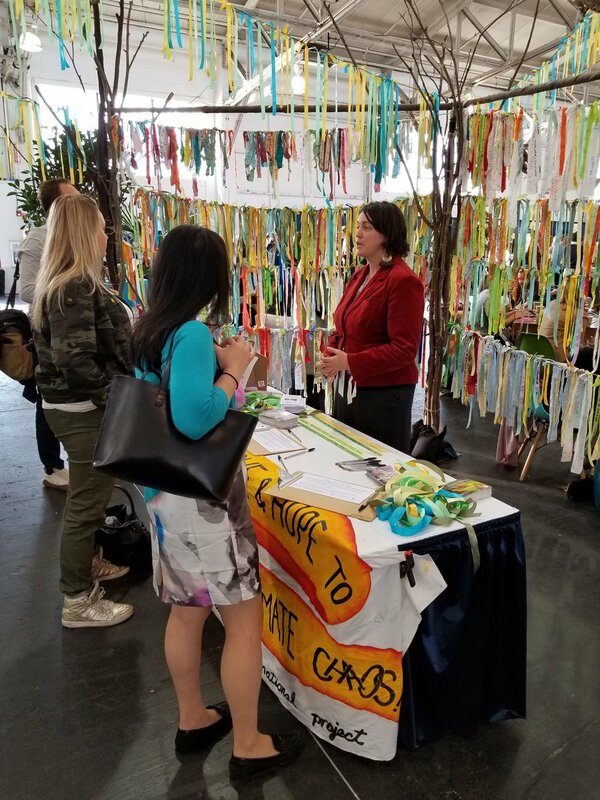 The Climate Ribbon was there at the entryway to bring home the urgency of the climate crisis and to demonstrate a ritual pathway for faith leaders to engage congregants in making meaningful commitments to action. 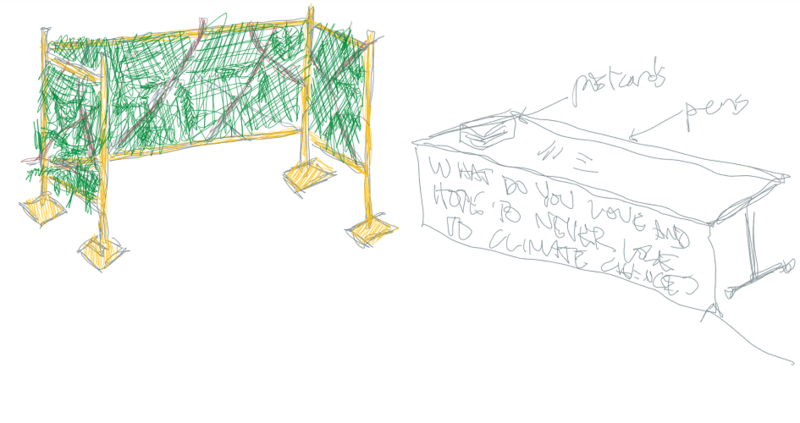 This was not the first time the Climate Ribbon was woven into this conference. 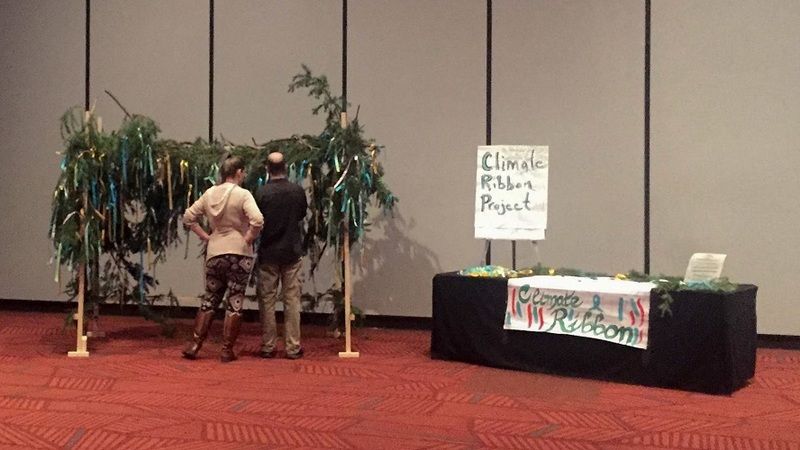 We were at the previous Parliament (in Salt Lake City in 2015), where we set up a large Climate Ribbon installation at the entryway of the convention center. It was an instant hit, as participants were excited to make their ribbons immediately after registering. Led by clergy from many faiths, over a thousand people made ribbons and tied them onto a large story-sharing wall. We took these ribbons to Paris and gave them to UN negotiators at the historic COP21. In 2018, our focus was different: to demonstrate the power of this simple ritual and encourage faith leaders to take it home to use in their congregations around the world. Every Climate Ribbon is customized for a location’s unique space and tone. So, our first challenge at the Metro Toronto Convention Center was how to transform this looming industrial entryway into a meaningful space for reflection and commitment. Using a combination of left-brain ritual technologies (floor plans, tape-measures, etc.) as well as right-brain skills (e.g. 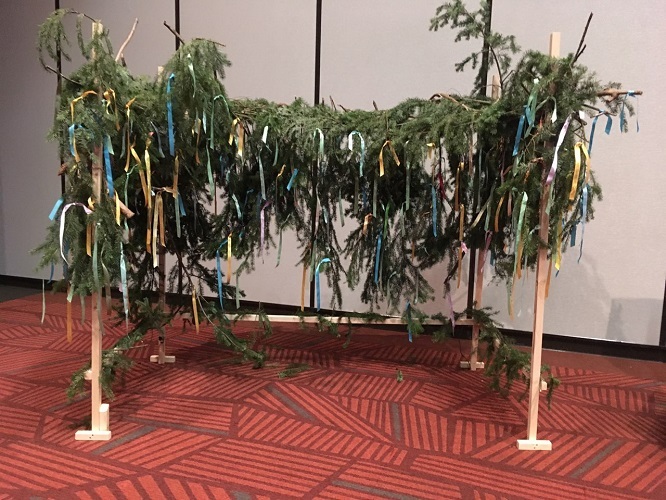 divination cards), our Climate Ribbon advance team, Rae Abileah, chose to build a womb-like grove of tree-sculptures with a ribboned doorway. However, she was smack in the middle of Toronto’s concrete and steel downtown, so finding branches for the sculpture was no easy task. Luckily, a posse of Earth-centric Jewish priestesses, who just happened to have a giant orange cargo van, guided Rae to a nearby forest, along the way telling her the histories of all the green places in Toronto and their connections to indigenous peoples. This “great branch schlep” was completed in the dark of night of All Hallow’s Eve, and by the next morning the Climate Ribbon was ready to receive the faith-filled masses. 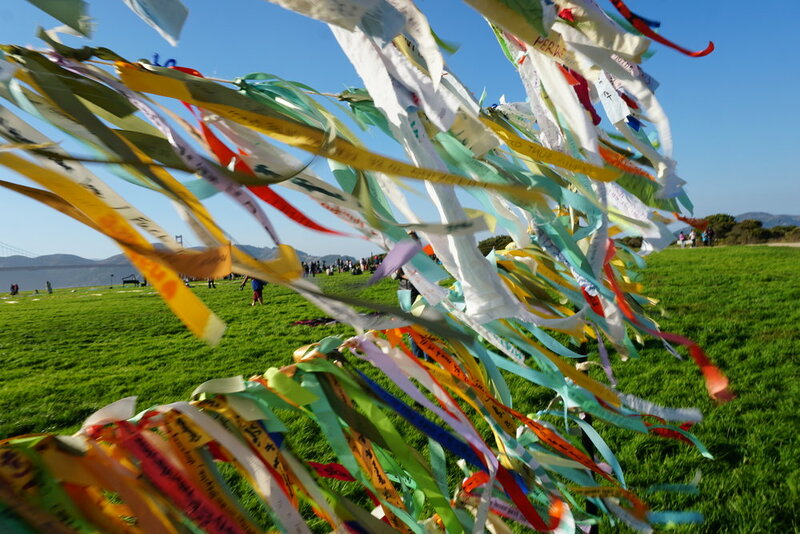 This sacred space drew in participants to not only make ribbons, but also to pray and make music together. Here’s a video of women drummers who uplifted the cavernous convention hall and brought people to make music and dance together! 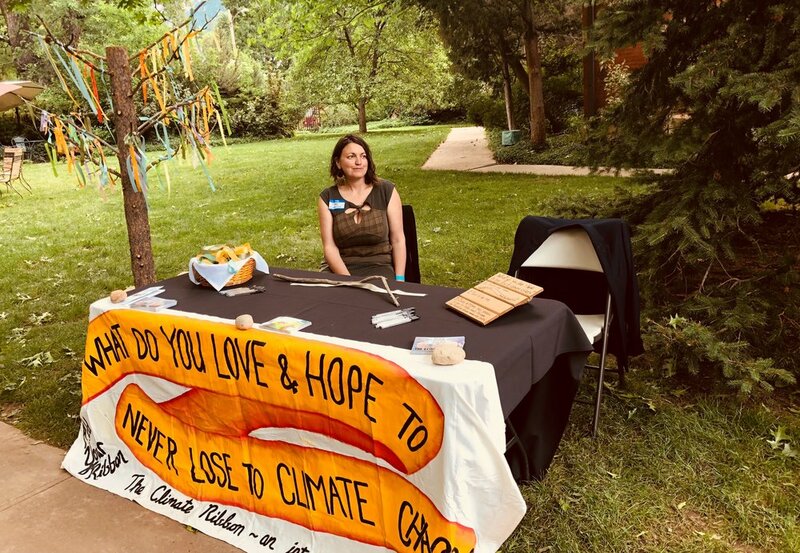 The Climate Ribbon greeted Parliament-goers with a grove of trees strung with brightly-colored ribbons, and a table on which a simple question appeared: What do you love and hope never to lose to Climate Chaos? Participants wrote down their personal answers to this question (alongside their name, age, and hometown), and tied their ribbon to the grove of trees. Then, looking through all the ribbons tied there, they found a stranger’s story that moved them, untied it from the Tree, and carried it with them throughout the Parliament. In the process of this sacred story-exchange, they became the guardian of what someone else most loves that’s under threat from Climate Chaos — and in order to protect it, they made a vow to take action for climate justice and a renewable energy future. Typically, when we explain the last step of the ritual, people respond with a shocked, “You mean I can actually take one?! Oh, no, I couldn't possibly do that!” But at the Parliament, we found two differences in the way people responded. First, the written instructions were enough to communicate all the steps of the ritual, (including the last step in which people are asked to take a ribbon home with them). As faith healers, they understood immediately. After all, ritual is the water they swim in. For us, this was yet another proof-of-concept that the Climate Ribbon works really well within faith communities. Second, attendees took the exchange very, very seriously. In many instances, people were physically struck, sometimes moved to tears, by the invitation to take home each others’ ribbons. They made heartfelt, emotional commitments to each other. 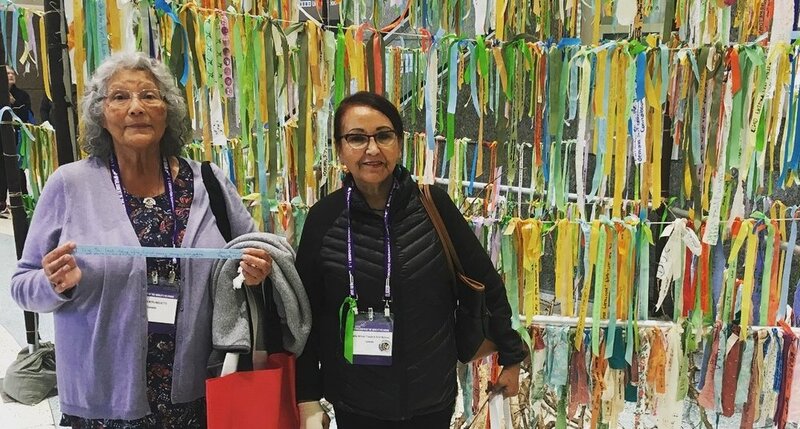 One woman about the waters on the land she grew up on in northern Canada, and shared her story of struggle for her people’s indigenous sovereignty in Canada… After she tied her ribbon up, she palmed through the hanging ribbons and selected a blue one. “What does it say?” Rae asked her. “Oh! It’s about the waters in Canada! How amazing to find a ribbon like mine!” she exclaimed. As it turned out, the ribbon was written by Salim, one of the employees at the convention center. Rae was later able to tell each about the other, and they were both moved. 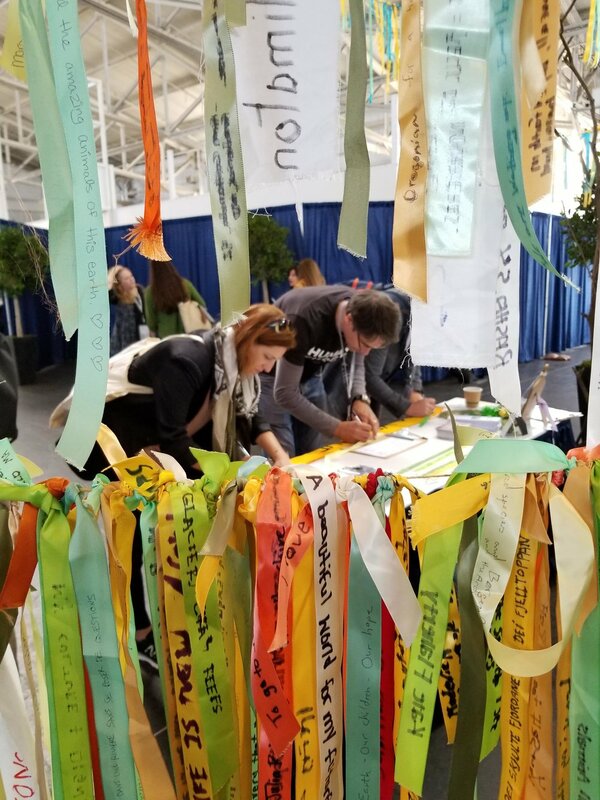 This is why the Climate Ribbon describes the experience as an “intimate solidarity”; people discover their common ground and sacralize their shared commitments in a very specific and personal way. Abby Mohaupt, Co-Director of the Green Seminary Initiative, shared how crucial a moment the ribbon-exchange was for her. She wore her ribbon on her wrist for the rest of the Parliament, and when she returned to her home on the California coast she was confronted with a question: what to do now with the ribbon? 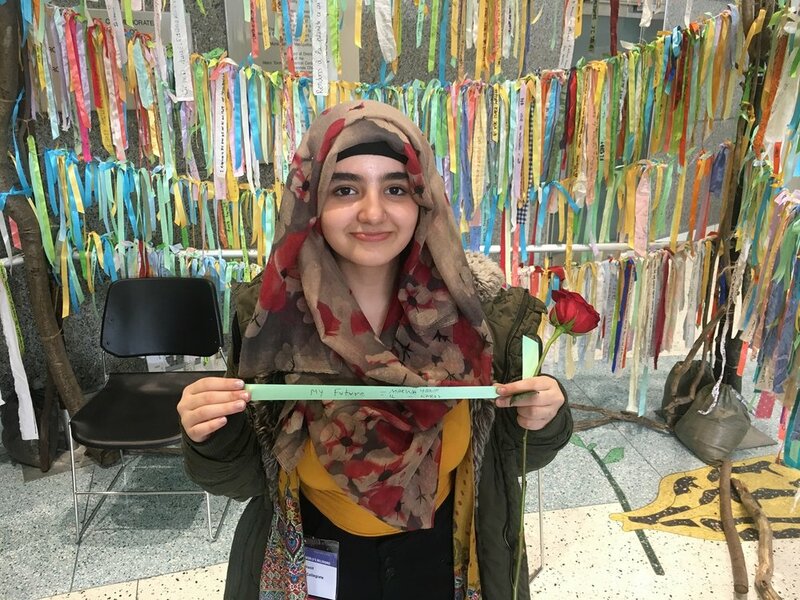 She decided to tie the ribbon around her grandmother’s lamp, a family heirloom symbolic of the light through the generations, as a daily reminder of her commitment to take prayerful and practical action for climate justice. 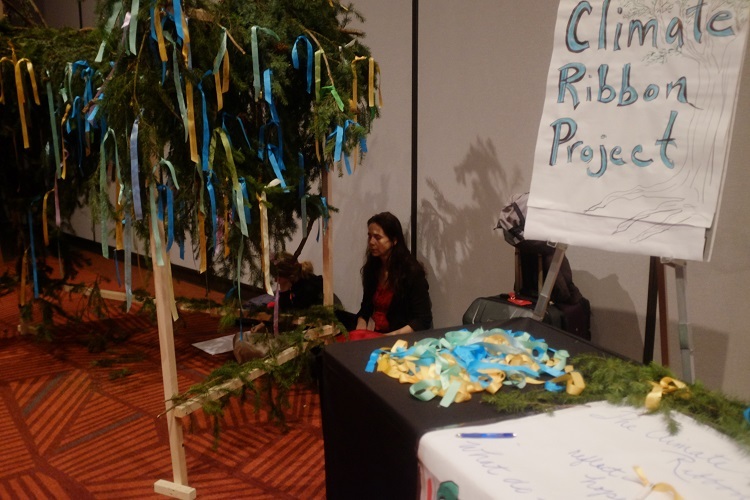 Greenfaith created a facebook live interview with the Climate Ribbon onsite which built the conversation beyond the conference. 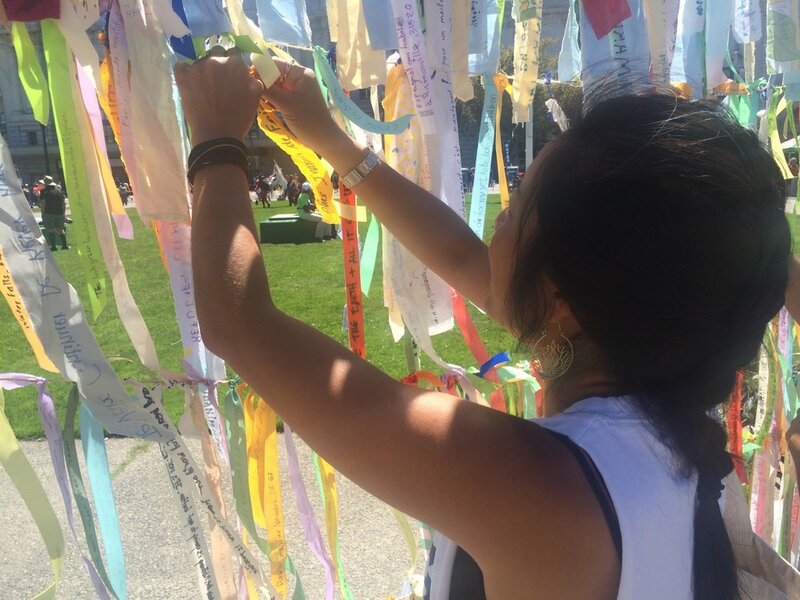 The Climate Ribbon @ the 2018 Parliament was created by Rae Abileah with help from many volunteers. The project would like to thank the Bronner family for their generous support, and Rae would especially like to thank the Kohanot, ordained Hebrew Priestesses. 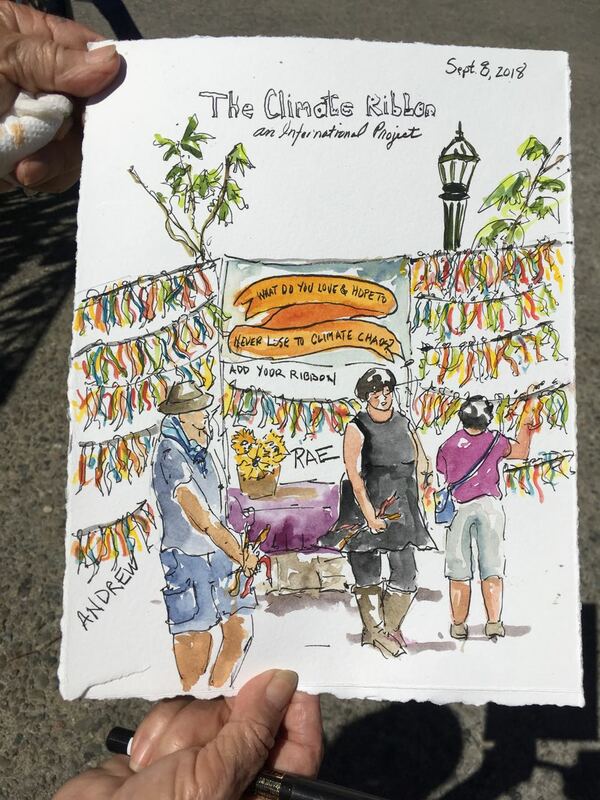 The Climate Ribbon could not have happened at the scale it did without their generosity of spirit, hard work, and ritual facilitation. 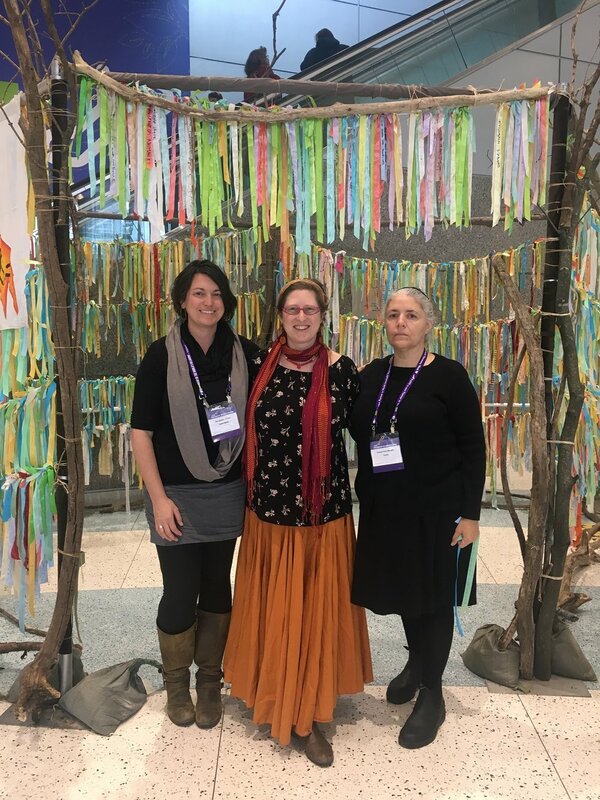 The project is deeply grateful for the way that this group of earth-centered, feminist clergy came together to help create, facilitate, and then take down this offering! 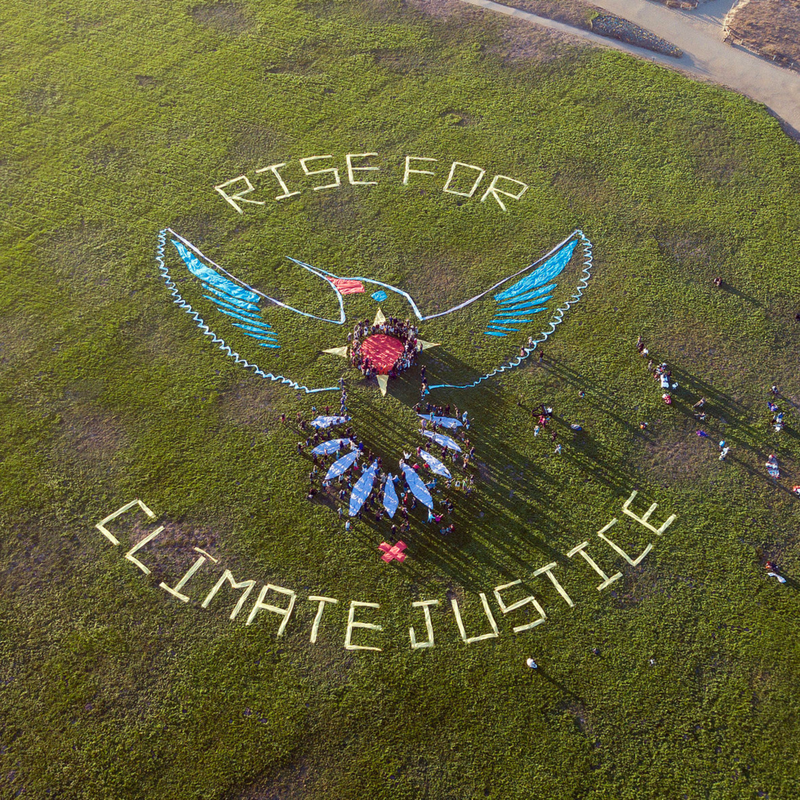 On September 8, 2018, the Climate Ribbon showed up in multi-colored force in San Francisco for the Rise for Climate mass mobilization. As 30,000 marchers poured through the streets, the Climate Ribbon was there to help remind people what they were marching for. 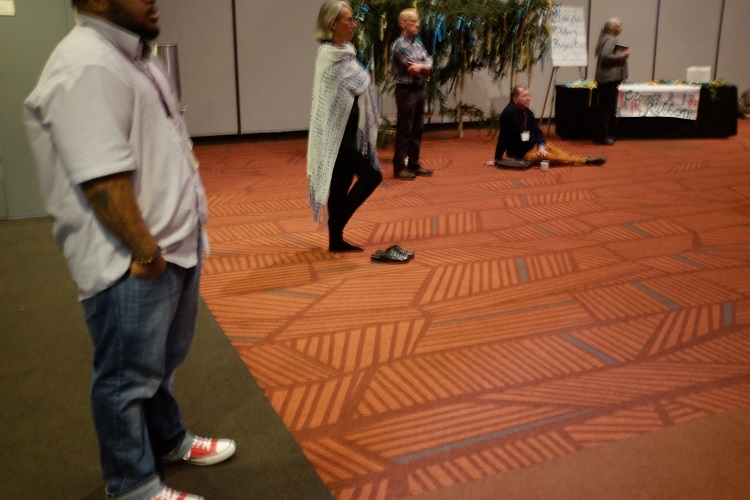 For one woman it was “Coastal Louisiana: My culture & people.” Patricia from Sacramento, CA, told us how her Unitarian Universalist church community had already woven the Ribbon into their congregation’s meditation labyrinth. As we were still setting up, local Californian Guido stopped by and shared his story of seeing the giant tree we built for the COP21 on display at an eco-village in Southern France. 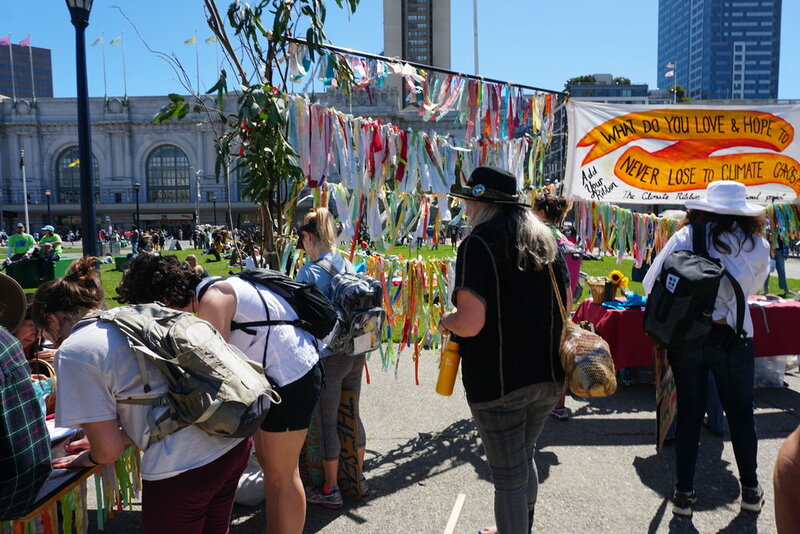 The Climate Ribbon — this time installed in a striking 12-foot-high two-panel installation, adorned with eucalyptus branches and leaves — was a familiar sight to some marchers, and a novel discovery for others. It provided a space for everyone to ground themselves, go deeply inwards, and reckon in a personal way with what each of us has at stake. Some teared up when they realized they were being invited to become the guardian for what someone else most treasured in the world that was under threat by our changing climate — and caught their breath yet again, when they realized some sympathetic stranger would eventually be doing the same for them. 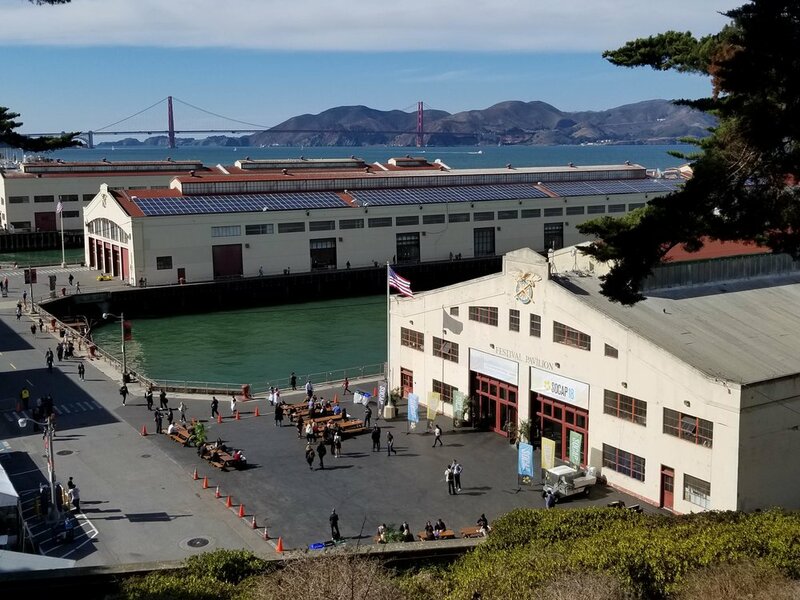 And that was just Day One of what was to be a long week of climate activities, inside the halls of power, on the streets, and in countless people-powered spaces around the Bay. 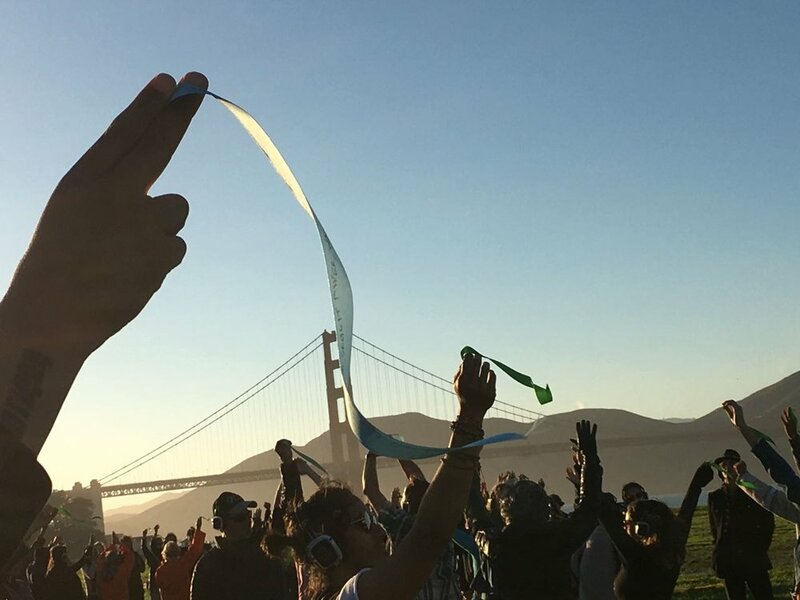 The following day, the ribbon was woven beautifully into a human hummingbird mandala aerial action by the edge of the Golden Gate Bridge (see a 90-second video created by Spectral Q, Dancing Without Borders, and partners). 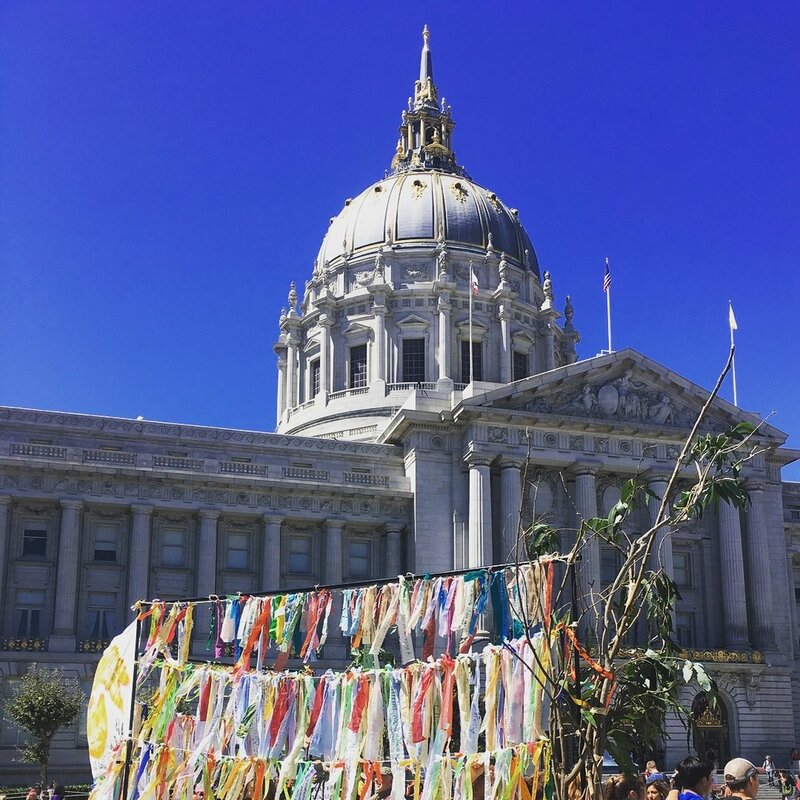 The Ribbon was also featured at the Multi-faith Service of Wondering and Commitment at Grace Cathedral with our partners at Greenfaith, who launched their new initiative, Living the Change, with commitments from all major faiths to sustainability and renewable energy. Next up: We’re taking the Ribbon to SOCAP18 (a major socially responsible investment conference in SF) in October, and then the massive Parliament of World’s Religions in Toronto in November. 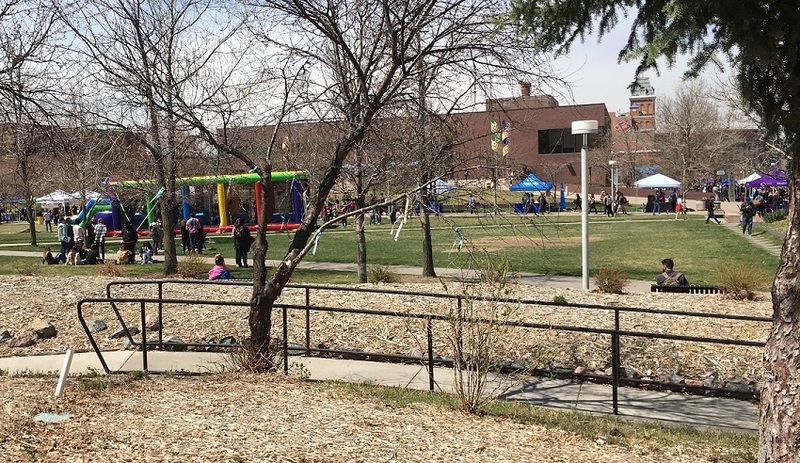 On Sunday, April 8, the Climate Ribbon was invited to Estes Valley Indivisible (EVI), as a main feature at their one year anniversary special event. After an inaugural year of many success, a major challenge that could have split the group was overcome. 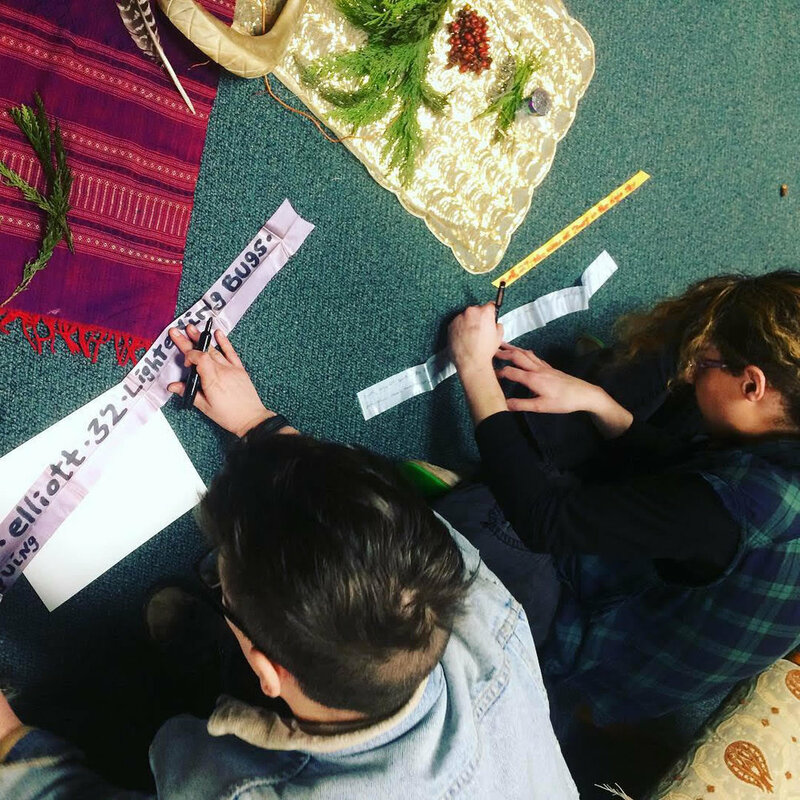 To mark the anniversary and celebrate coming together, Jasmine Holan and Rae Abileah co-created the ritual presentation, and in the process dreamed up a new version of how to make and assemble a Climate Ribbon Tree, that you can use in your community. The ritual went beautifully and the group brainstormed ideas for how to use the Climate Ribbon in their local outreach, renewable energy campaigns, and community engagement moving forward. 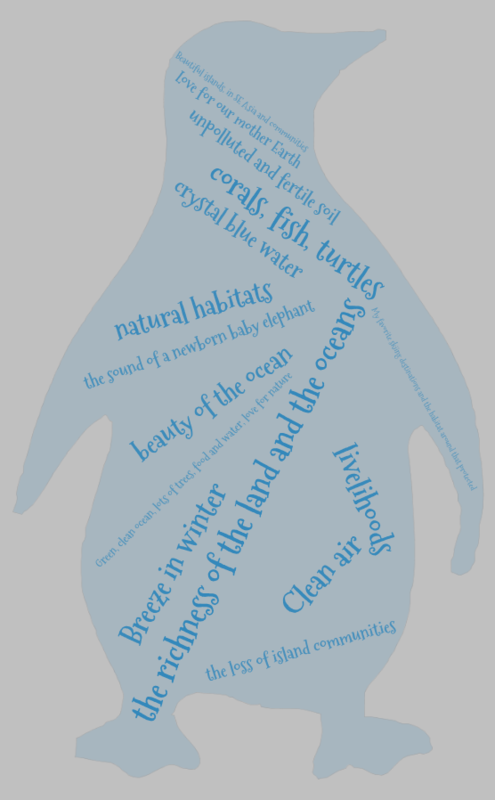 They formed a steering committee with eight people to put these ideas into action… stay tuned for more! 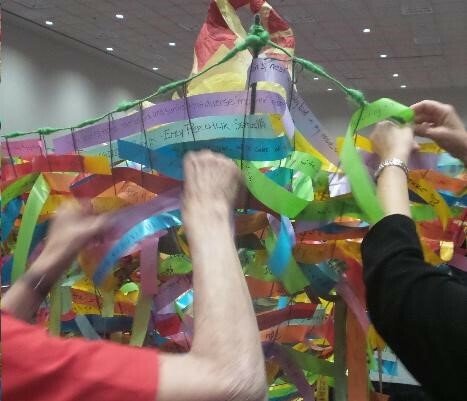 Following a successful Climate Ribbon event back in 2015 at the Unitarian Universalist Association’s General Assembly, featuring a 5-foot tall “Climate Ribbon Chalice” made from a discarded patio umbrella, in April 2018 the UU’s Ministry for Earth renovated the Chalice and invited members to create new ribbons. 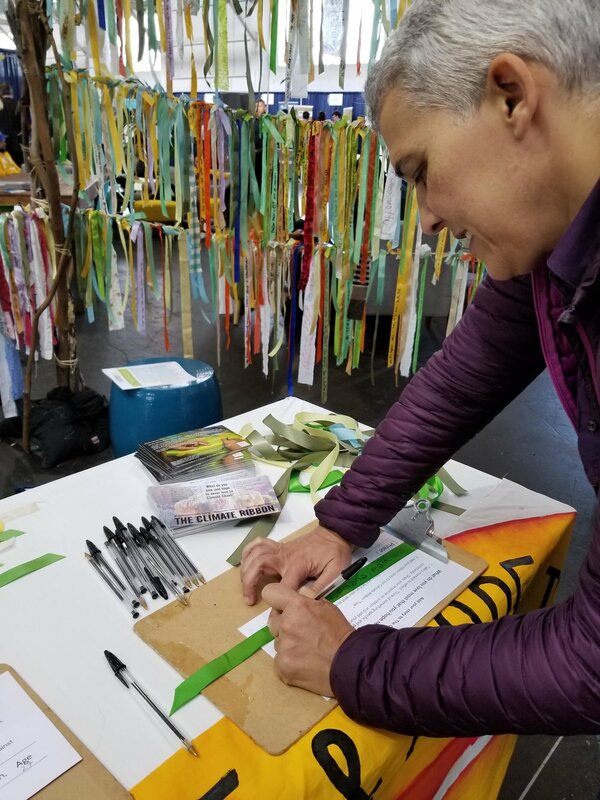 They invited UU climate activists to use the Climate Ribbon to engage members of their congregations in climate justice ministry by creating an interactive community art installation that would stand throughout 2018 and beyond. We are so happy to hear that the UU has renovated their beautiful Chalice, into which they will continue to weave their heartfelt thoughts and emotions!